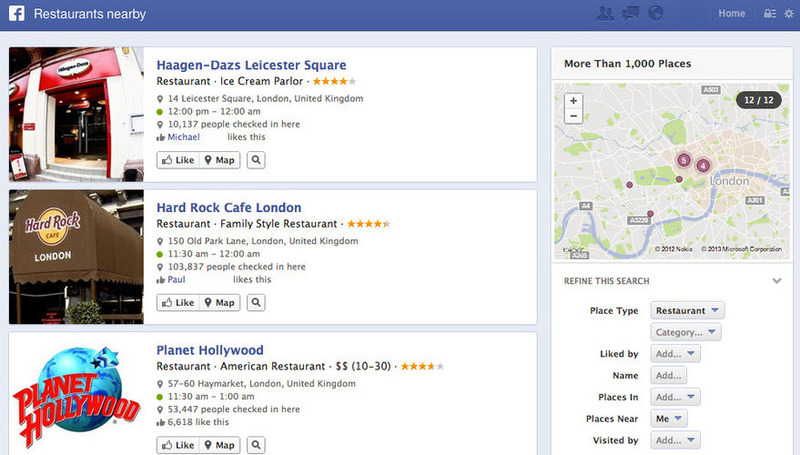 Example of a Facebook search for "restaurants nearby" for a searcher in London. With a reported 1 billion users, 240 billion photos, and 1 trillion connections in its arsenal, Facebook has created a different type of search. Traditional search results pull from a massive dataset of indexed pages from all over the Internet. Facebook skips the crawl and indexation stage, relying instead on the content that each user shares and the connections between them to make up its dataset. Just think of all those Likes, reshares, comments, and other content that only Facebook has full access to. As a result, Facebook’s search results can offer truly unique content and connections found nowhere else. If Facebook can’t supply relevant search results, it turns to Bing for traditional web search results. In addition, Bing has the sole honor of incorporating Facebook data into its search results via Facebook’s API. So whether you’re searching on Facebook or Bing, Graph Search should produce more social results to aid in content discovery. That’s in theory. In practice few people have access to the new Graph Search on Facebook yet and Bing’s integration is in its infancy. 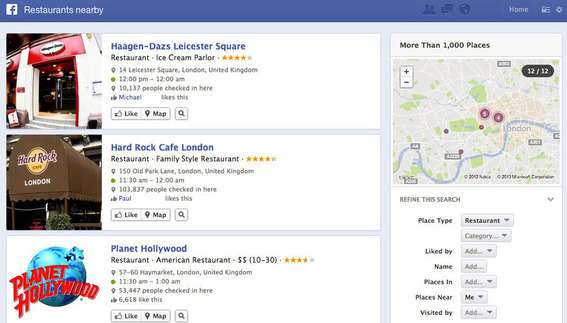 From a business perspective, the most exciting aspect of Facebook search is the local search angle. Recommendations from friends are a powerful inducement to try something new, and Facebook search makes it easier to discover the places and things your friends like. Facebook has had the pieces for this new product for a while — Places and Pages to house business information, the ability to friend or follow, and the ability to check in and comment. All of these are vital pieces of the puzzle. But each interaction with a Place or Page was merely dumped into the user’s Facebook News Feed or Timeline. The result was a fleeting stream of information that might get noticed but would probably be overlooked or quickly replaced with something newer. Those are all missed connections, missed chances to discover. With Facebook search, these connections are discoverable at will. I probably didn’t notice that five of my friends had been to the same restaurant and liked it because the information was so briefly displayed in my News Feed. But a quick search on “restaurants near me that my friends like” will surface those scattered connections and prompt me to consider that restaurant at exactly the moment when I’m open to discovering new restaurants. The same principle holds true for all sorts of brick-and-mortar businesses. Consider a runner in the market for new cross-trainers. He might search for “running shoes my friends like” or “sports stores near me.” Searches like these would turn up local stores or products that the searcher’s friends have liked, checked in to, and commented on. Assuming this runner has other friends who are enthusiastic about running and training equipment, his Facebook search results should offer some compelling recommendations for products to buy and stores to visit. If you have a physical location, you can have a Place page on Facebook. If you have many physical locations, you’ll have a lot of Places to manage. Even if you have no physical location, you can still have a Page on Facebook. The extent to which Pages will be pulled into local Facebook search results with Places remains to be seen as access opens to all users, but regardless of whether the search results are local commerce or ecommerce in nature, it behooves businesses to be present and active on Facebook now more than ever. Whether it’s a Place or a Page, some of the same opportunities exist for optimization. Like all search optimization, think of optimization for Facebook in terms of relevance and authority. Relevance speaks to the opportunity to describe the business accurately and using the words that consumers are likely to use, as well as your favorite marketing-speak. Make sure that every possible information field is filled in and accurate, especially the name, category, vanity URL, and information you share in the “About” section. All of these will help people find your business on Facebook. For Place pages, ensure that the address is accurate. This is critical to appearing in Facebook’s local search results. Businesses with many locations may want to look into working with a local search agency to manage the relevance and accuracy of the content in Facebook, as well as across Google, Yelp, Foursquare, Bing, YellowPages.com, and the hundreds of other local search players. On the paid advertising side, Facebook hasn’t disclosed any specific plans for advertising on Graph Search. According to comments made at the announcement, Facebook is focusing first on developing the search functionality for its users and may possibly monetize it in the future if it proves successful as a feature.